Quilting is my all-time favorite thing to do, but a close second to quilting is watching my kids play sports. There’s nothing like a spending the afternoon at a sunny baseball game watching my oldest boy play center field. 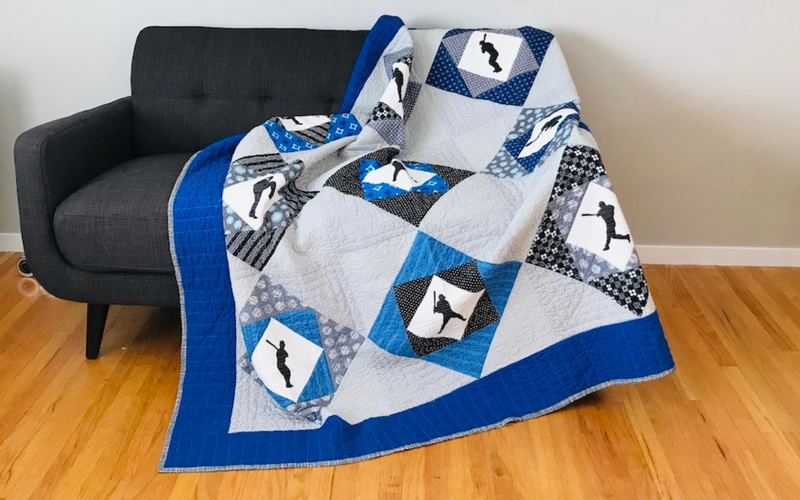 This quilt is inspired by hours at the ballpark watching him do what he loves very most. 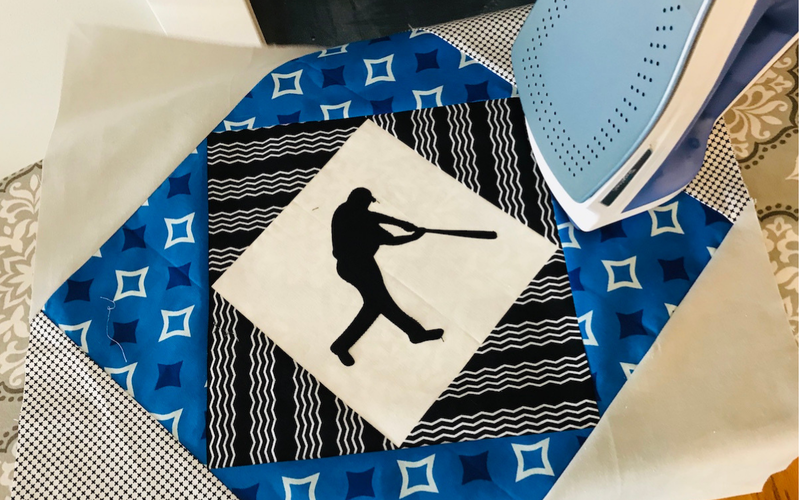 I used fabrics in his team colors and cut baseball player silhouette shapes with my Silhouette Portrait® to make a one-of-a-kind quilt that he will cherish for years to come. 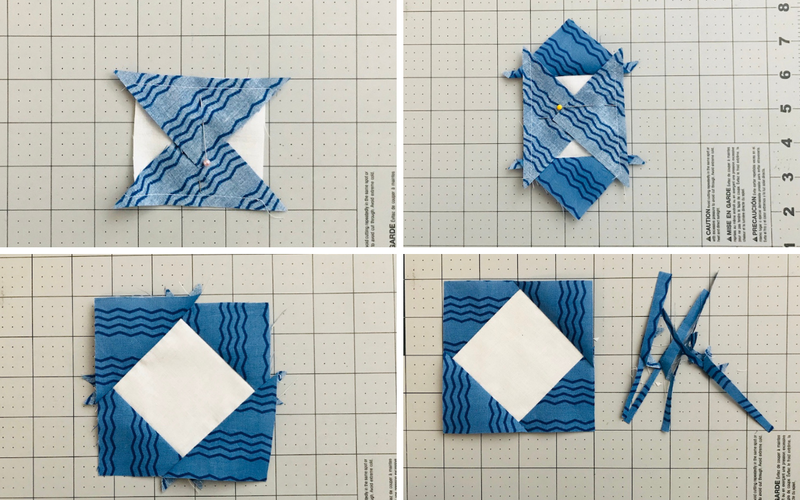 This quilt is pretty simple and fast to create—inspired by the economy quilt block, but with an extra layer. You will love how quickly these blocks come together. Do your kids love sports too, but not baseball? There are several types of silhouettes to choose from in the Design Store. 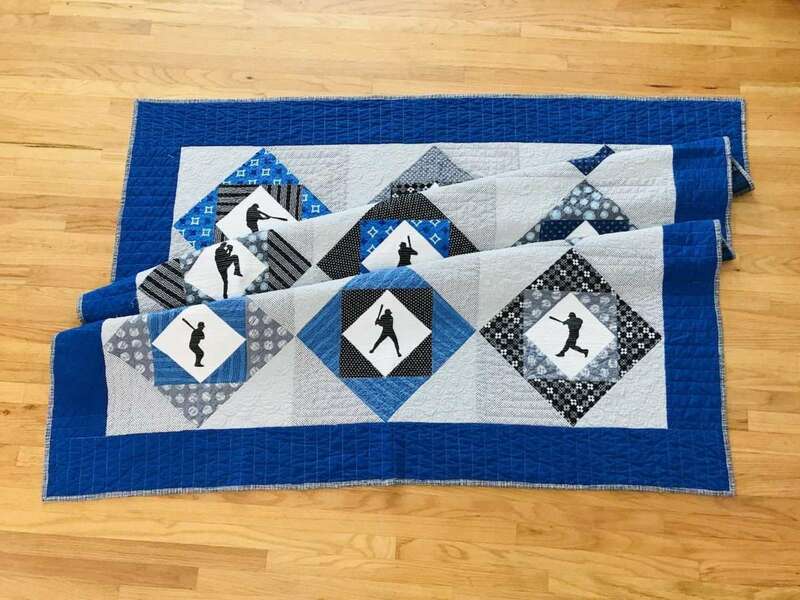 You could make this quilt with basketball players, football players, or even cheerleaders or dancers! Because this quilt is made with triangles, most of the sewing will be done on the bias edge. The bias edge can be a little tricky to work with because it is stretchy. To minimize stretching I recommend starching your fabrics before you cut them. There are many starch products on the market to choose from. I have used both Faultless Starch (found anywhere) and Best Press (found at quilt shops) and have had great success with both. 1. 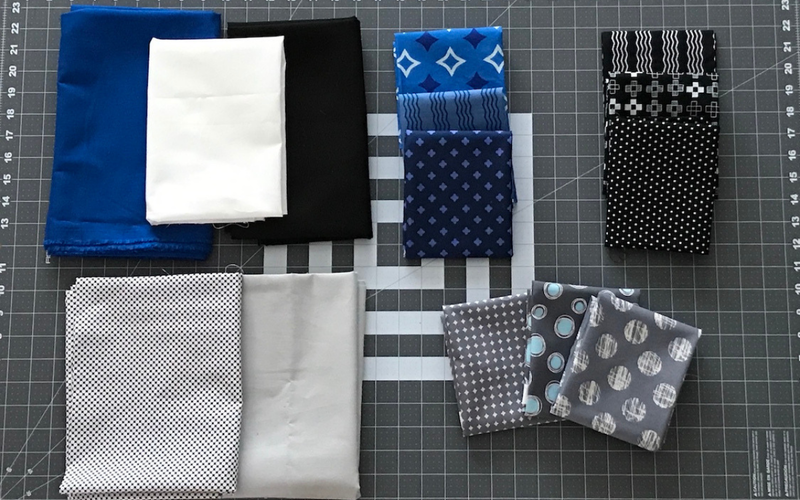 From each fat quarter, cut: (2) 6 1/2-inch squares and (2) 9-inch squares. 2. Cut each of these in half diagonally to make two half square triangles per square. 3. From white fabric, cut (2) 7 1/2-inch by width of fabric strips. Subcut these into (9) 7 1/2-inch squares. 4. From each background fabric, cut (3) 11 1/2-inch strips. Subcut into (9) 11 1/2-inch squares per background fabric. 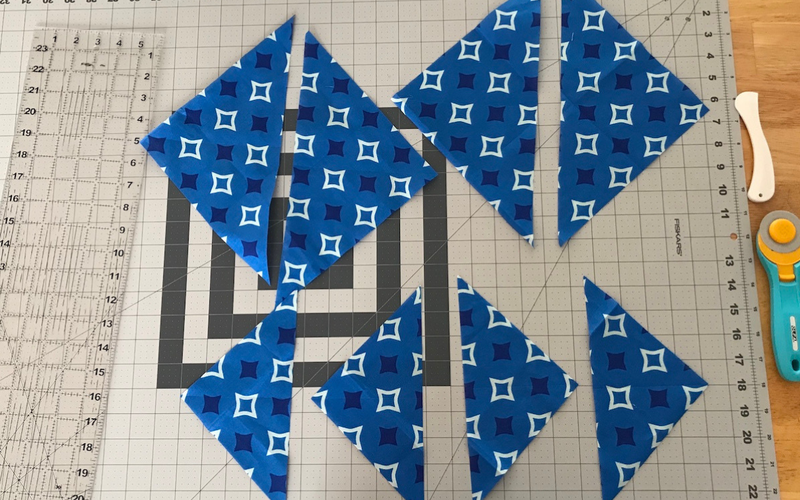 Cut each 11 1/2-inch square in half diagonally to create (18) half square triangles per fabric. 5. From black silhouette fabric, cut (2) strips 7-inch by width of fabric. Subcut into at least (9) 7-inch squares. You may want one or two extra of these. 6. From fabric stabilizer, cut (9) squares that measure 6 3/4 inches. You may want to cut one or two extra in case you need to recut any silhouettes. 1. Iron the fabric stabilizer to the wrong side of each black square. Follow the manufacturer’s directions. I like to iron over each of mine twice, making sure that the web is adhered on the entire square. If there are spots that are not adhered well, they may not be cut perfectly with the Silhouette. 2. Open the Baseball Pose design (Design ID #62555) in Silhouette Studio®. 3. Ungroup the design by selecting it, going to the top menu, and clicking Object > Ungroup. 4. Slide 4 of the silhouettes away from the design area. 5. Select the remaining baseball silhouette. From the top menu, select Object > Rotate > Rotate by 45 degrees clockwise. 6. Slide the baseball player silhouette so that it is centered in the top left 7 inches of the design area. 7. 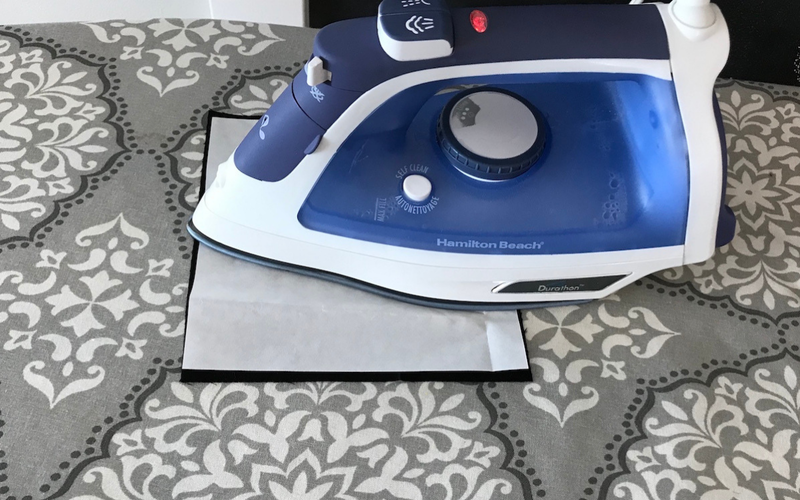 Place a black square of fabric with the fabric-stabilizer backing on the top left corner of the cutting mat. Make sure it is securely attached. I like to leave the paper backing on the fabric. 8. Adjust the fabric blade to 5. 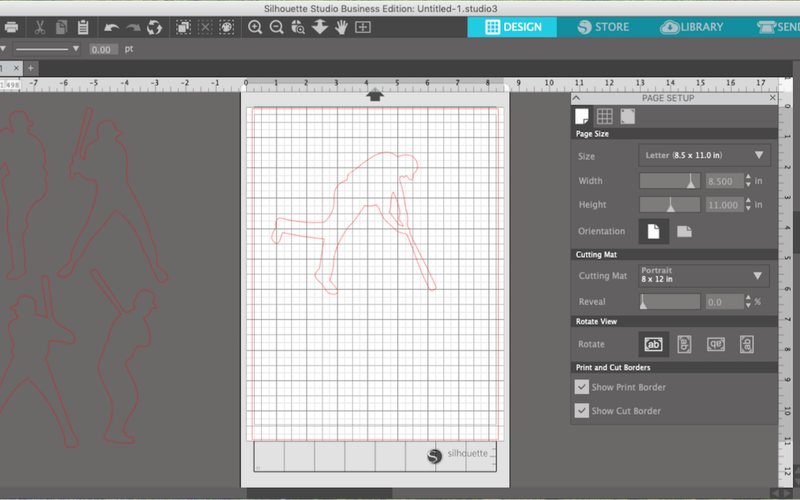 Load the cutting mat into the Silhouette. 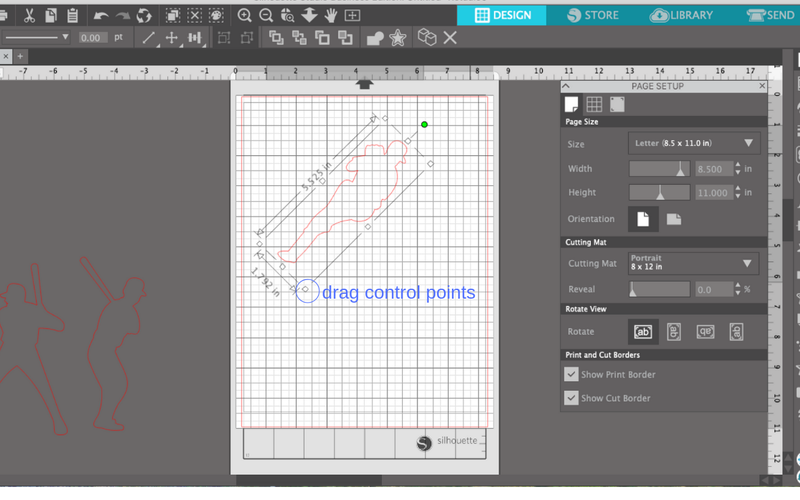 In the Send panel, choose “Fabric, Thin Cotton Print” to create your cut settings and then send the design to your Silhouette machine. 9. Carefully remove the cut shape from cutting mat. You may want to have a pair of small fabric scissors on hand in case there are a few threads that need to be clipped. 10. Delete the image you just cut from the design area. 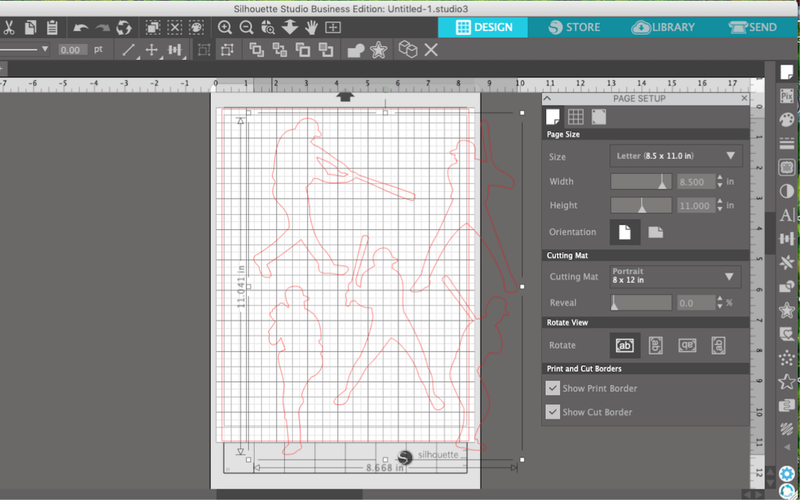 Move another baseball player silhouette to the design area. Repeat these steps for each baseball silhouette but make the adjustments listed below. To resize the images I used the control points on the shapes selection box. Drag one of the corner points until the measurements are close to the ones above or until the shape fits nicely inside a 7-inch square area. 11. I changed the Home Run Silhouette to a mirror image. To do this select the Home Run Silhouette by clicking on it. From the top menu, click Object > Mirror > Flip Horizontally. 12. Remove the paper backing from the fabric silhouettes and set them aside while you assemble the quilt top. 1. 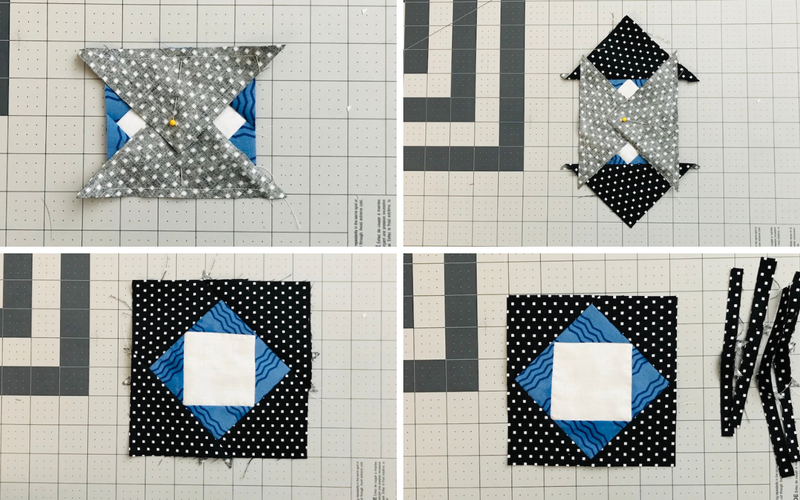 For each quilt block, you will need (1) 7 1/2-inch white square; (4) matching 6 1/2-inch triangles; (4) matching 9-inch triangles; (2) 11 1/2-inch triangles of gray; (2) 11 /12-inch triangles of the black and white print. 2. Arrange the fabrics in stacks, mixing and matching fabrics until they are arranged how you like them. 3. Using a Hera Marker or a pen with vanishing ink, mark the center of each triangle. Also mark the centers of each side of the white squares. 4. Sew a 6 1/2-inch triangle to the top and bottom of the 7 1/2-inch white square. Match the centers using the marks you made in the previous step. Sew with rights sides together, using a 1/4-inch seam allowance. Press the seam allowances away from the center block. 5. Next sew the remaining 6 1/2-inch triangles to the sides of the 7 1/2 inch white square. Once again, match the center marks. Press the seam allowances away from the center. 6. Trim the block to a 10 1/2 inch square. To do this, lay your white square on your cutting mat with points lined up vertically and horizontally. Lay your ruler vertically on your mat, aligning it with the lines on your mat. Measure 5 1/4 inches from the center of the block or 1/4 inch from the right point. Trim. Then rotate the block using the trimmed edge as the square edge. Measure 10 1/2 inches from the cut edge and trim again. Repeat with the opposite two sides. 7. 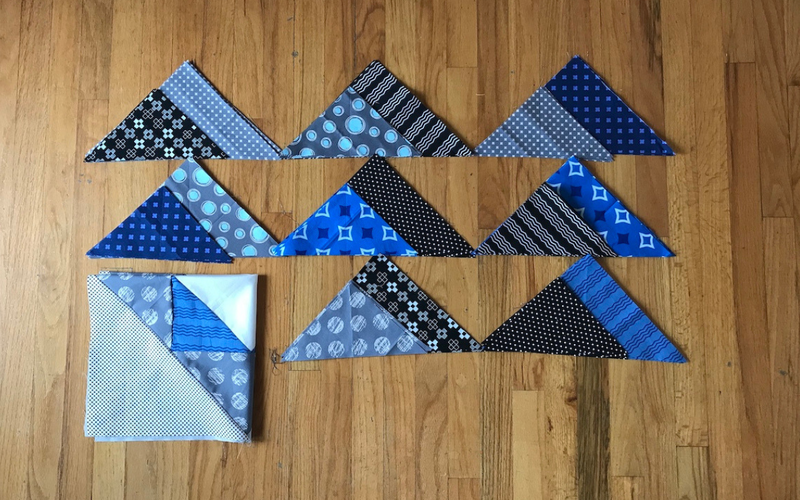 Sew a 9 inch triangle to the top and bottom of your 10 1/2 inch square. Match the center marks with the points. Press the seams to the outside of the block. 8. Repeat with remaining two triangles on the sides of the blocks. Match your centers and press the seams away from the center. 9. Trim the block to 14 1/2 inches using the same process as earlier. 10. Sew two gray 11 1/2 inch triangles to opposite sides of the block you just trimmed. Place the right sides together and match the centers. Press the seams to the outside of the block. 11. 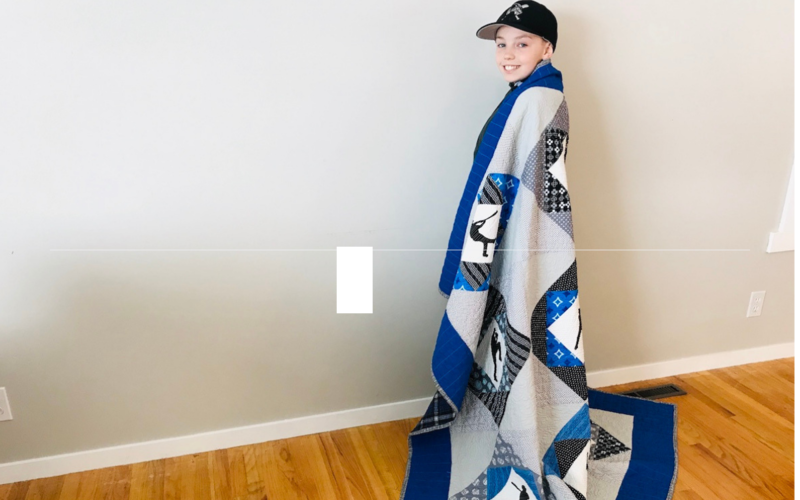 Sew the two black and white print, 11 1/2 inch triangles to the opposite sides of the 14 1/2″ block. Match the centers with right sides together. Press the seams to the outside. 12. Trim the finished block to 20 1/2 inches. 13. Lay your finished block on your ironing board. Make sure the gray triangle is on the upper left side. Center a baseball silhouette in the white diamond. Iron the silhouette design in place following the manufacturer’s directions on your fabric stabilizer product. Tip: If you prefer, you can raw edge appliqué your baseball players to the blocks at this point. Instead, I am going to secure the baseball players later on with dense quilting. 14. Repeat the above process for all nine stacks of fabric to create nine blocks. 15. Lay out the blocks in a 3 by 3 grid, arranging them so that you like the mix of fabrics. Sew rows together using a 1/4-inch seam allowance. Press the seam allowances to the side, alternating directions for each row. 16. Place the center row on the top row, with their right sides together. Match the block intersections and pin in place. Match the points and pin in place. Sew together with a 1/4-inch seam allowance and press the seams to the side. Repeat the process to add the bottom row. 1. For the quilt border, cut (7) 5 inch by width of fabric strips. Join the strips end to end with a 1/4-inch seam allowance. Press the seams to one side. 2. 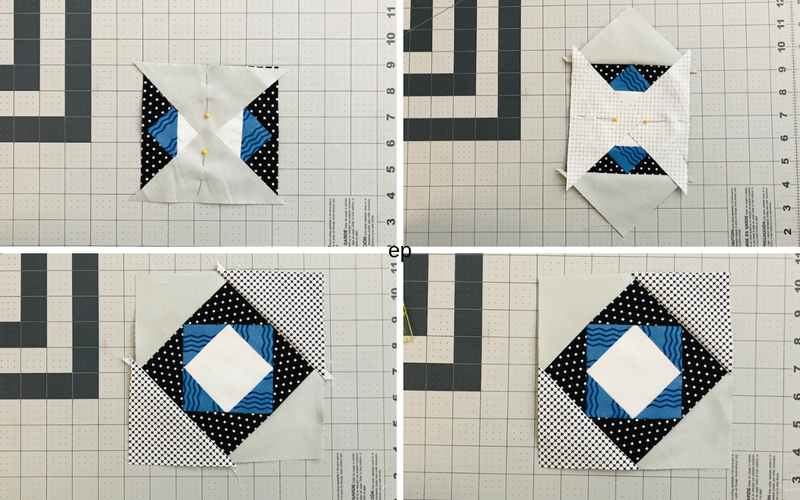 Measure the left and right sides of your quilt, and cut border strips to match the size. The measurement should be about 60 1/2 inches. Pin the strips to the sides of quilt and sew with a 1/4-inch seam allowance. Press the seams toward the border fabric. 3. Repeat the above steps with the top and bottom borders. Measure the top and bottom edges of the quilt. They should be close to 70 inches. Pin the cut border strips to the top and bottom edges of the quilt. Sew with a 1/4-inch seam allowance. Press the seams to the outside border. 1. 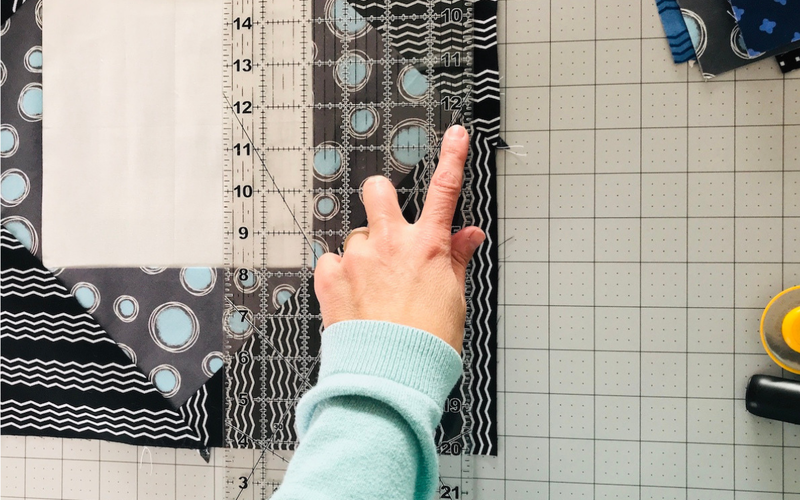 Cut your 4 1/2 yard backing fabric into two sections—2 1/4 yards each. Remove the selvedge edges. Pin and sew backing sections together along one of the selvedge edges. Use a 1-inch seam allowance and press to one side. 1. Quilt your finished quilt top using your favorite method. I quilted mine on my long arm quilt machine. 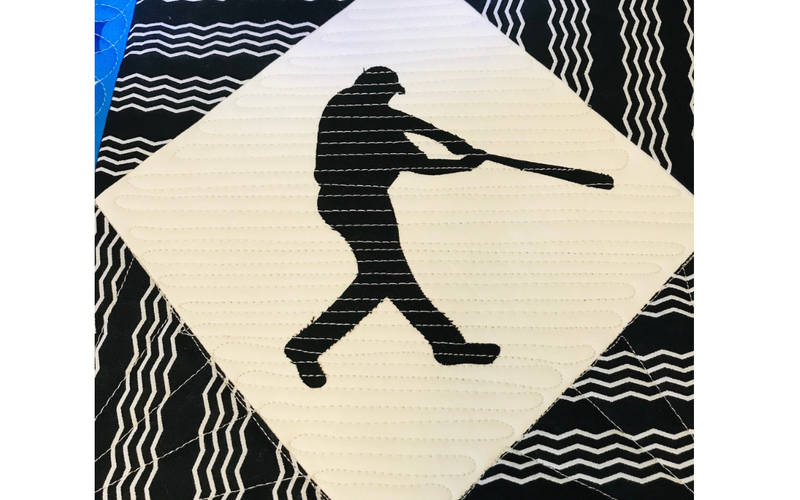 To secure the baseball player silhouettes in place and prevent them from coming loose during use and washing, I quilted them down using dense horizontal lines. When quilting, try to quilt about 1/8 inches away from the edges of the silhouettes. I used a light gray thread for all of the quilting on my quilt. 2. From the binding fabric, cut (7) 2 1/2 inch by width of fabric strips. Use your favorite method to join the strips and sew to your quilt. My favorite binding method can be found here. 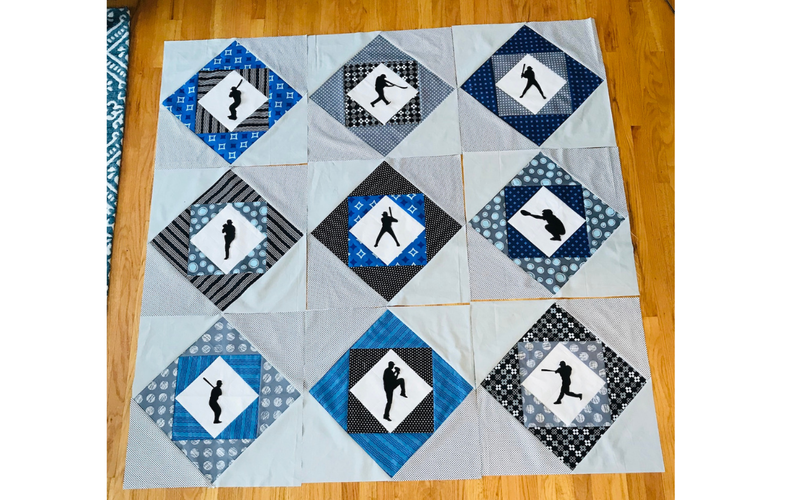 This Center Field quilt quickly became a favorite at our house! I backed this quilt with the perfect blue and black plaid flannel. I love the added warmth flannel provides. Inside the quilt is my favorite 100% bamboo batting from Winline. Bamboo batting has the best drape of any batting I have tried and therefore makes the most cuddly quilts!